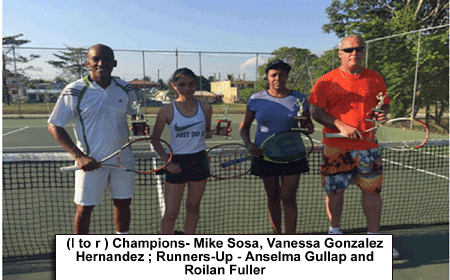 BELIZE CITY, Tues. May 10, 2016– The newly refurbished Belmopan Tennis Courts were buzzing this past Saturday with lots of tennis, as the Belize Tennis Association, in collaboration with the Belmopan Tennis Club, held a Tennis Mixer (strong and weak) doubles tournament. Some twenty eight (28) players (fourteen doubles teams) played round-robin style. The top four teams who made the finals after the round robin were Robert Lee & Charlene Lee, Roilan Fuller & Anselma Gullap, Mike Sosa & Vanessa Gonzalez Hernandez, and Samira Musa Pott & Dalix Hernandez. Sosa and Hernandez edged Pott and Hernandez to advance to the finals; while Fuller and Gullap overcame the Lee couple to become the other finalists. In the finals, it was neat to see the skills and court coverage by the stronger opponents of Mike Sosa and Roilan Fuller, and the tenacity of their respective partners, Hernandez and Gullap; but in the end, the Sosa & Hernandez team proved too good, taking the victory over Fuller and Gullap, 6-3. Trophies were presented to the champions and runners-up. The Belize Tennis Association also took the opportunity to hand over some much needed tennis equipment to the Belmopan Tennis Club for continued tennis development, especially amongst the youths. The Belize Tennis Association wishes to thank the Belize Olympic and Commonwealth Games Association via their Olympic Solidarity Fund for providing the financial grant that made this possible and also special thanks to the International Tennis Federation (ITF) for granting some of the equipment and providing constant support. All tennis players in the country are encouraged to get back on the courts, and look out for upcoming tournaments by checking out the Belize Tennis Association on face book.